The Satirical Christian: Three days to go ...! Three days to go ...! Following our last post , 'The End is Nigh!' things have moved really, really fast, and there are just 3 shopping days left before Judgement! Earthquakes, wars, and an obscure Biblical formula that makes the Da Vinci Code look like kindergarten, have confirmed that judgment will commence at 6pm on Saturday 21st May - unless of course you live in Samoa because they can't decide which side of the international date line they're on. say whether this meant East Coast, West Coast of somewhere in between. 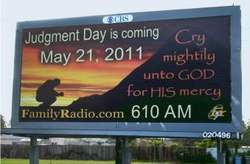 A world-wide poster campaign, advertisements and 'Rapture Ready'T-shirts @ $18.90 have been alerting the world to this impending doom. It is emphasised however, that the T-shirts will be available for a limited time only. date that Islam was founded. 21st March 1843 and 22 October 1844 according to William Miller. In response, many Christians sold all their possessions and quit their jobs, only to call the second date "The Great Disappointment" after nothing happened. 1914, 1915, 1918, 1920, 1925, 1941, 1975 according to the Watchtower Society - 1975 being the favourite because it was 6000 years since the creation of Adam. The fact that these predictions did not come true has not deterred Harold Camping from making his prediction, and has not deterred many from following him. Neither has the fact that he also predicted the end of the world for 6th September 1994. Apparently Jesus hadn't read the script. But don't worry if you are a little too busy to prepare this week, because the 21st May is only the beginning of the end. If you miss the promised earthquake and rapture (during which all true believers will fly up to heaven) there are still another 5 months to go before the earth is totally destroyed on 21st October. So plenty more shopping days to squeeze in. @ Nick: That sounds entirely reasaonable.